The first bonafide snowstorm of the season arrived around midnight last night. 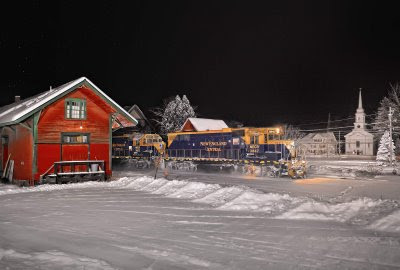 To me, trains look their best at night in snow, preferably falling as well. It's the secret ingredient that makes night photos of trains in winter so appealling to me. So when I discovered a snow storm arriving from the Great Lakes late last night, I scrambled out into the car and headed for Westport. Guaranteed to be "a mess" with temps in the low thirties, wet snow would act like rain on the locomotives, bringing out the deep colors! 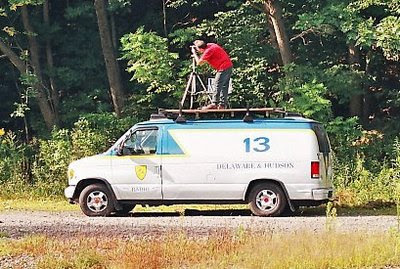 My concern was first, would I see a train, and second keeping the flash units dry enough once set-up. Driving into Port Henry, I most fortunately overheard dispatcher Kelly Knight telling 415 at Whitehall of a 253 coming towards them! Whoa! 251 & 253 have been powered by SD 40-2's on occassion lately, and running time up to Westport would be around two hrs. I figured. Should I wait to hear from 252 or set up for 253 and hope.....for an SD 40-2 leading? Pulling into the lot here at Westport around 01:30 brought my answer. WOW! At worst, I thought, this would be good shooting practice for the Holiday Train I planned to encounter on Wed. An hour and a half later the flash units are in position, protected from the wet snow by zip lock freezer bags, I get everything powered up and take a few test shots. The approach signal for "Howards" just out of sight down into the curve here, lights up green over yellow, indicating to me, and the approaching 252, of a meet with 253. By now the weather is a mess with the temps. on the edge of freezing, sleet starting to replace the snow, BUT the surroundings look gorgeous! "They might", I'm thinking to myself. They might run an SD 40-2 tonight! After 252 sweeps past with an uncharacteristicly short train, I contribute a "light show" for the early risers in the neighborhood when one of the flash units gives in to the sleet and starts firing continuously, causing the Pocket Wizard remote attached to it to send out "fire" signals in turn to the rest of the system, which obediently follows suit! Jeesome Crow! So I change out that flash with the only unit not used, still dry, do a quick check around and don't see anyone at their window, don't hear anyone cussin' and happily walk back to the stepladder and the black umbrella propped against it, protecting the camera and lens. The sound came after 04:30, the familiar sound of SD 40-2's pulling upgrade into "Howards" from the lakefront trackage north of Port Henry. We're in business! 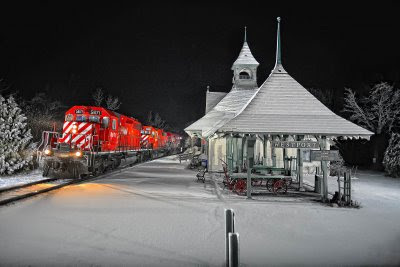 Up on the stepladder, you hear the small tree branches snapping nearby under the wet snow as you see 253's headlights at the horizon while they pass the talking detector just north of "Howards", and within a minute or so, CP 5671 comes out from behind the station here into a sea of white under a black sky completing a Christmas Card scene. Three hours and a half after arriving, success! Shot with the 5D and Zeiss ZF 28/2 (Nikon) set at f2, on Nov. 25, 2008 at 04:56. Flash units on the platform and the walkway up back were erased in photoshop as were Gary's footprints. Please enjoy! Comments are welcomed. I bought a Bachmann-Spectrum 2-8-0 with sound and have been having fun with it. 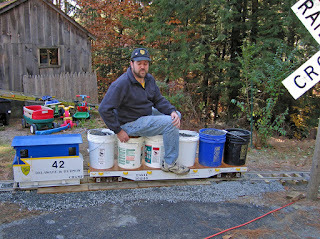 It doesn't fit well into the Skene Valley Railroad so I decided to run a Rutland Milk Train, just for the fun of it. 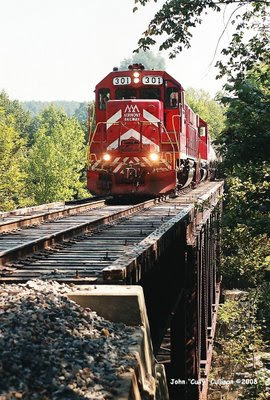 The CP 422986 was purchased by Operation Lifesaver from the storage yard behind the engine shop in St Luc back in the spring. It was transported to Saratoga for delivery to the Ballston Industrial Track so the Saratoga County Fair could truck it to their property. It was delivered in July and was expected to be moved in August. The move was delayed until the first week in November and it is now 'home'. If all goes as planned, it will get a nice red paint job and general rehabilation. Fortunately the moving contractors revised their plans...they wanted to cut off the copula for the move but it ended up going over with only the brake rigging etc. removed. Gene Corsale, Community Coordinator for Operation Lifesaver, Ballston Spa School system worked endlessly to make all this happen. The caboose was built 11/1970 as CP 434325 at their Angus shops, and renumbered 422986 at St. Luc on 9/20/94. Going through the streets of Ballston Spa. D.A. Collins moved the caboose, started 7am. Backing into the fairgrounds, around 4pm. 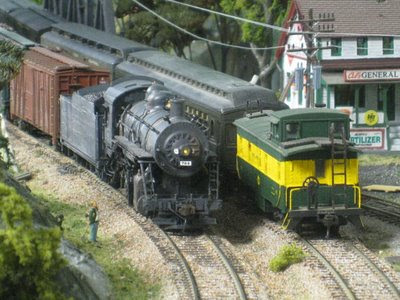 Brad Peterson's Kayaderosseras & Southern Adirondack Railroad. 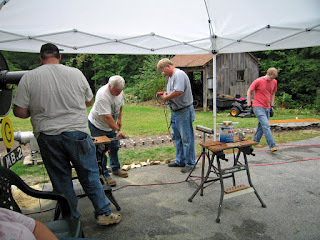 On Sept. 14, 2008 we had a tent set up for shade and a safe work area. Here Rich Veldman has just finished cutting over 200 new ties for the rail that has just arrived. Skip Densing and Bob Hosmer are getting ready to start drilling the rail ends for joint bar installation by Tim Stockwell. This was my biggest project of the summer, I finally found the hardware for the helix and got it all put up. The upper level (QS cabin and beyond) turned out to be too high, so I still have to get around to lowering things to fit. I also added to the B&M engine shop area in September, though there is really no track installed to speak of. Nov. 2, 2008 Work Extra D&H 42 gets ready to head south with a full load of stone for the new section of track built since September. Not ready for a picture to be taken. Final touch up to the ballasting done today is being supervised by Bill Bibby with Tim Stockwell and JR Stevens doing the dirty work. This is the trackage adjacent to the driveway near the culvert. After the workers have gone home and things have settled down this view of the K&SA shows signal 0.2, MP 1, the crossing cross bucks and the end of track is behind the little green man. We had a great turnout at Frank Adamec's house on Thursday October 30th. Frank surprised with scenery finally getting underway in the new section of the layout. He also tore out the old shops, and reorganized the paper mill area. He will eventually add large diesel shop in the middle of the layout. Mark Oliviere took a few great shots on one of Frank's scratch built bridges. Mark got another shot. With all the pink and blue styraform in need of plaster. More of a dramatic shot by Mark. 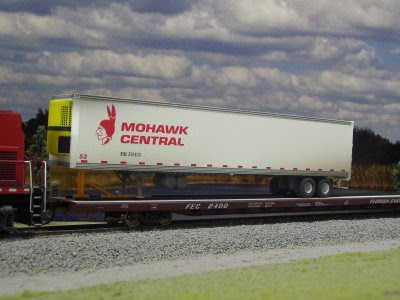 I got a shot of Frank and a long freight going over a rough copy of the Hudson River bridge in Mechanicville that Frank also scratch built. They look like snow capped mountains but really just need some paint. Such a small space, Frank decided to add a mirror to double the room size, pretty neat effect. My basement is now back together now, after a new addition on my house caused a large section to be dismantled. EL 315 bringing a block of cars to the upper tracks for pick up of a road job. The road jobs travel around the dog bone swapping blocks of cars between several locations on the layout. Avery self adhesive stickers are color coded with two colors which represent the two "locations" that the blocks travel between. On my "pre-addition" layout every car had a sticker. This was quite arduous because the random nature in which I applied the stickers caused capacity problems at various locations at various times. 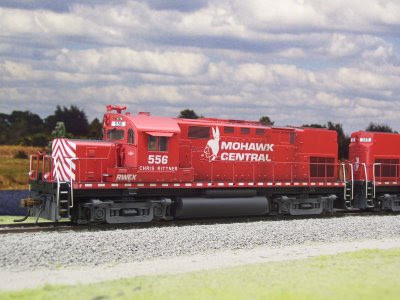 Although it mirrors CP operations in the capital region and thus adds a touch of operational realism, the train movements became anything but standardized. Now I just put a matching sticker on each end of a block of cars. At the other end of the layout we see the open staging area. The two trains toward the left are opposing movements to the two on the right. One of the layout "locations" is seen on the left. 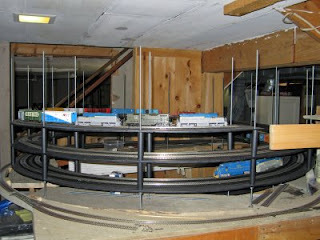 It is a three track stub ended yard representing Jersey City. So operationally a block of cars with a light blue/dark blue sticker on each end will travel from the Jersey City tracks to the C&O tracks and return in a subsequent session. This photo shows the bulk of the layout that was dismantled for the construction of a new bathroom in the floor above. Contractors were able to kneel on the bench work while installing the plumbing. A friend & fellow model builder is kitbashing a huge Ford plant which will obscure the two trains you see here. 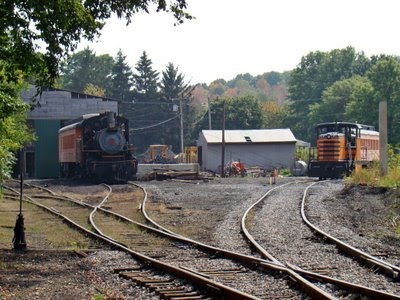 Three different ballasts can be seen representing the three railroads using the yard. Soil for EL, gray for PC and tan for C&O. The abandoned tower on the upper level obscures the hole in the wall for the loop on this end of the dogbone layout. Notice color sticker on top of the ICG car. That's me and here you can see the new ballast at lower Cheshire yard. The C&O transfer run is coming in on the right from a two track, stub ended, hidden yard. 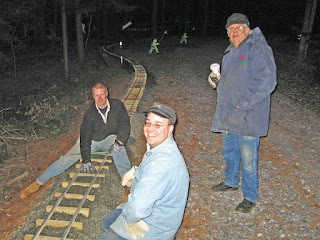 The entire middle of my layout was dismantled last winter when we had an addition built to our home. Notice the plumbing access hatch in ceiling. Also notice crooked tangents in track work allow for an appearance closely following the practices of CP Rail in Albany and Saratoga, LOL. 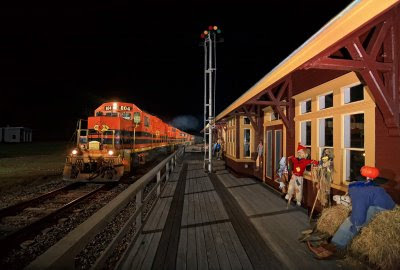 We are visiting the newly renovated North Stratford, NH station (ex-Grand Trunk) tonight. All decked out for Halloween, the building is the new home for the town library. I'm sure the location provides a good reading atmosphere during the daytime hours, as the only trains pass by late at night. I like the replaced semaphore. The priceless stuffed straw figures accent the lines of the station windows while they turn viewers attention toward the power. Plus they are free models! I got away with moving one down to this end, and did'nt push my luck any further! LOL! This location was among legendary photographer Phil Hastings favorite destinations in the late 1940's, a superb Hastings photo of the MEC conductor signing the register book from inside the bay windowed operator's room is in Ron Johnson's "Maine Central Railroad, Mountain Division". 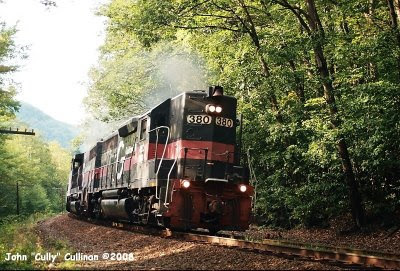 Sixty or more years later, the light ten wheelers and their mixed trains that captured Phil's creative mind are long gone, but the railroad remains in a more modernized state as the New Hampshire Central curving away from the SLR main behind the 804 in this scene. Tonight's train 393 is led by road slug 804, with a trio of orange & black brothers trailing. Shot on Oct. 11, 2008 at 02:17 with the 5D, and Nikkor 14-24 lens set at f2.8 and 15mm. I'm ecstatic over the new lens's performance here at f2.8 with sharpness out to the right bottom edge! "Much lighter processing used here also, having learned something (hopefully) from the last attempts at processing the daylight photo from Willsboro. Please enjoy! Comments are welcomed. Randy Epstein sent along a few pictures. B&M and N&W bicentennial schemes. He says "an unlikely combination" but still neat and maybe not too far fetched. Mark's new Bachmann Spectrum 80 Ton 3 Truck Shay with DCC and Sound, very nice. King of the mountain! No just Mark working on the logging line scenery. Freddie is mixing up another batch of plaster, the class yard is to the right of him. A blurry picture of Dave working is better than no picture at all! 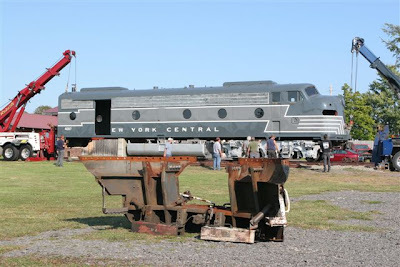 Joe Merli didn’t quite know what to do with the 1950s-era, General Motors-built E-8 passenger locomotive, but knew he couldn’t allow the 60-ton steel beast go to the scrap yard, the Schenectady Daily Gazette reports. So he purchased the Pennsylvania Railroad’s Engine No. 5762 and had it hauled back to his small manufacturing shop off Western Turnpike, where it sat for more than a decade. During that time, Merli’s vision for the Canal Street Historical Society began to manifest itself. He first thought about building a replica rail station around the engine as a tribute to early-20th century American industrialism. Then Schenectady’s Wallace Armer hardware store closed in 1997 and Merli’s vision grew. Over time, a pole barn by his shop was transformed into an authentic, late-19th century general store featuring many of the old shelves pulled from the Armer building. A small drainage ditch was dug out and extended to make it look like a smaller replica of the old Erie Canal basin. 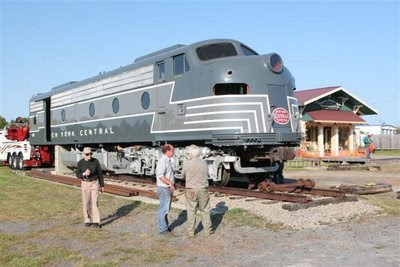 And the diesel engine was painstakingly restored to bear the gray-and-white lightning stripes that were the trademark of the New York Central Railroad. After 14 years, Merli has fully restored the exterior of the locomotive, which now awaits its new purpose as a soda fountain and malt shop attached to Merli’s growing complex of period buildings. The original 12-cylinder diesel engine and twin-steam generators have been removed from the locomotive, leaving a cavernous space on the interior. 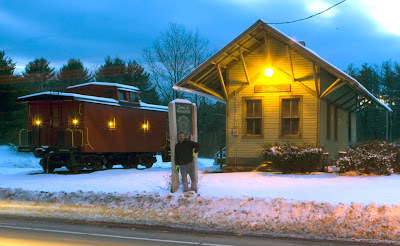 Over the next few years, Merli plans to install a countertop for the malt shop and connect it to a replica 1880s Victorian-era train station he plans to build between the locomotive and general store. “We’ll have a full image in here of a 1950s soda shop,” he said, surveying the locomotive’s interior. When completed, the complex of buildings will be Merli’s personal tribute to a bygone era in the United States: a time when American ingenuity laid tracks that spanned the countryside and brought seemingly boundless prosperity to the nation. It’s a period that Merli holds with deep reverence as its monuments get chopped up by scrap metal hunters. Years ago, the former autobody specialist started building replicas of carriages and other historic vehicles. He now operates the Merli Manufacturing Co., a 60-year-old, family-run business that has since produced period push carts and carriages for businesses across the United States, including Disneyland, Busch Gardens and Paramount Studios. Merli’s project to build the Canal Street Historical Society is aimed at protecting a snapshot of the time period. Merli eventually wants to transfer the property and buildings over to a nonprofit organization that will act as caretaker for the historical attraction. “It’s to remind us of what we had and how proud we were of the monuments we built,” he said. Stepping into the general store is like stepping back in time. Through hundreds of donations and his own seemingly endless hunt for authentic period memorabilia, Merli has even stocked the shelves with rivets and bolts and assorted other supplies still wrapped in their turn-of-the century packaging. Merli has installed a track ladder that slides among the shelves as it once did in Wallace Armer more than a decade ago. He also plans to re-create the cable car that once zipped through the building to deliver change to Armer customers. But the real showpiece is the beautifully restored locomotive. It’s the centerpiece Merli plans to use as a draw for curious passersby as they trek down Route 20. Merli has always had a steady procession of curious travelers stopping to inspect the engine, which was once parked next to his small manufacturing shop. Those visitors have multiplied since he moved the train last week to its permanent location on a more visible stretch of tracks he built perpendicular to the road. There was even a greater spectacle during the actual move. He had the help of Ric Lucia and Mike Becker, operators of the Duanesburg-based Pro-Motion Recovery and Towing, who lifted the body with a pair of cranes, placed its rear on a set of wheels and then towed the hulking structure several hundred feet to its current location. Becker downplayed the difficulty of moving the mammoth engine. He said the only difficulty came with maneuvering the train from its spot by Merli’s shop. “It’s all in a day’s work,” he said. Prior to the move, Merli was helped by Auto Body of Schenectady, which supplied him with the volumes of special primer needed to coat the body. Passono Paints of Watervliet and Art Trans Graphics of DeWitt provided him with a final coat of paint and detailing at little cost. “If it wasn’t for these friends of mine that helped me out, this wouldn’t be here,” Merli said of the engine. Article from Chris and pics by Deano!!!!! 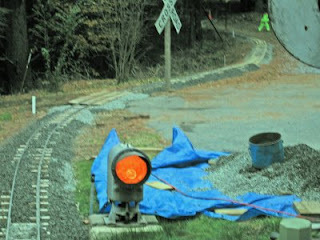 We often overlook the work that goes into keeping a railroad running. John spent his summer helping rebuild the tourist and freight line, Arcade & Attica, with your tax dollars. Money well spent as far as I'm concerned! 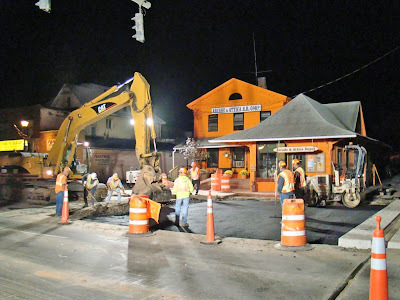 The dramatic night shot above is the night time replacement of the main street crossing in Arcade, NY. The"bread and butter" of the A&A sit outside the Arcade shops, getting ready for a new day.